Posted March 12, 2018 . GAFFI’s program to reduce deaths from fungal diseases with HIV in Guatemala in 2017 shows that at least 55% of serious infections in AIDS are fungal, dwarfing tuberculosis. Over 2,000 HIV patients were tested from across the country and 371 (16%) had a life-threatening infection that is always fatal without therapy. 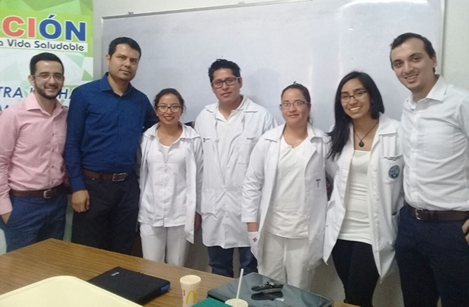 The diagnostic and training was undertaken locally by the Asociación de Salud Integral (ASI) in Guatemala City. In 2016, GAFFI started to implement a new integrated model of advanced HIV care in Guatemala with the objectives of educating Health Professionals (partly delivered online through www.fungired.gt, more rapid diagnosis of fungal disease and TB, and sourcing affordable medications for treatment. A network of 13 HIV units were clinically trained and then delivered samples by courier to the ASI central reference laboratory, using online requests. In 2017 enhanced coordination of the network was achieved with improved recording of all clinical samples and patient data into a central facility (through a website); faster Reference Laboratory workflow was targeted to increase turnaround time of samples (most within 24-72 hours). Training: Conference transmitted via Zoom from Hospital Regional de Cobán. In comparison with 2016, prior to the network being implemented, we observed a 111% increase in the diagnosis of opportunistic infections – a rise of 176 to 371 cases. Importantly, the network ruled out these potentially fatal infections in 2123 HIV cases, allowing an earlier start of antiretroviral therapy and therefore the chance of a better outcome for the patient. In 2018, molecular diagnosis of Pneumocystis pneumonia and antibody testing for aspergillosis will be implemented to give a fuller picture of fungal infections in AIDS, and provide additional treatment or discontinuation of empirical treatment options. Assessment of clinical outcomes is ongoing, as an estimated 1,600 died of AIDS in 2016, a high proportion of the 46,000 HIV-infected people. In Guatemala, only 36% of these HIV-infected people are on anti-retroviral therapy.